Deconvolving optical coherence tomography (OCT) image from the system's point spread function (PSF) can enhance image quality. While conventional approach performs deconvolution after image reconstruction, a novel OCT image processing technique is proposed and validated to perform iterative sparse reconstruction that simultaneously deconvolves object from PSF. Two researchers, Assistant Prof. Xuan Liu from Michigan Technological University and Prof. Jin U. Kang from The Johns Hopkins University, proposed a novel optical coherence tomography (OCT) image processing technique to enhance the resolution and the signal to noise ratio (SNR) of image. It is reported in Chinese Optics Letters Volume 12, No. 5, 2014 (http://www.osapublishing.org/col/abstract.cfm?uri=col-12-5-051701). One of the big technical thrusts in OCT is improving the OCT imaging quality with cost-effective software approaches, such as deconvolution. In previous studies involving OCT image deconvolution, images were first reconstructed with standard OCT signal processing procedure and afterwards deconvolved with the system point spread function (PSF). However, the performance of these reconstruction-deconvolution approaches is highly dependent on the noise level of the raw spectral data. Moreover, these approaches would further decrease the image SNR after deconvolution. The OCT image processing technique developed by Assistant Prof. Xuan Liu and Prof. Jin U. Kang could successfully overcome these problems. The spectral shape of the broadband light source of OCT system has been taken into consideration in their iterative sparse reconstruction. Therefore, their method essentially deconvolves the PSF from the blurred image during image reconstruction rather than after reconstruction. 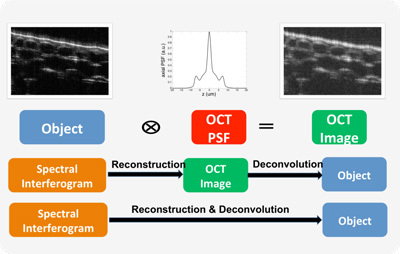 Results obtained from numerical simulations and experimental OCT imaging show that their method could effectively deconvolve the axial PSF from the blurred image during reconstruction and simultaneously preserve the SNR of an OCT image. Although iterative algorithm by nature is computationally massive, their method can be accelerated using graphic processing unit (GPU) for real time OCT imaging, which will be their future work.